Association of the Victims of Uphaar Tragedy (AVUT) was founded when the totally avoidable and unnecessary Uphaar Fire tragedy struck Delhi on June 13th, 1997, raising important questions about our social values and our ability as a nation, to implement and enforce some of the most basic laws governing the safety and survival of our people. 59 people lost their lives for no fault on their part. The last 21 years have been excruciating and agonizing for us. However, the outcome of the cases has, in fact, impacted public safety which has resulted in Public Spaces being more fire safe than what they were two decades back. The authorities and the owners/ occupiers of the public spaces have become more conscious and fire compliant. We at AVUT are undertaking all possible steps to avoid manmade disasters like “ Uphaar”. AVUT’s endeavors have ensured that due attention is given to safety norms in public spaces, specially cinema halls & Multiplexes with owners and Government authorities ensuring strict compliance of fire safety rules. The implementation of the “Jai Prakash Narain Trauma Centre (AIIMS)” by the Union of India. This project was in fact a nonstarter since 1983 and it was only during the hearing of the Civil writ filed by AVUT that the Hon’ble High Court of Delhi, had directed the Union of India to set up the trauma centre which was the main prayer in our Writ Petition. The Supreme Court in the year 2015,while convicting the owners of Uphaar Cinema in the appeal filed by AVUT , had imposed a fine of Rs 60 Crore. This amount has been paid to the Delhi Government to set up another Trauma Centre. On a proposal by AVUT to the Union Government for bringing in a legislation to prevent man-made disaster in Public Spaces, the Law Commission of India has published a consultation paper dealing with man-made disasters. Our endeavor is to get this legislation passed on a priority basis. To organize Seminars, Debates & Workshops to highlight the lack of basic safety measures in public spaces specially Educational Institutions , Multiplexes & Malls . To ensure implementations of the judgement of safety laws, rendered by all Hon’ble Courts in the country. To highlight the need of effective enforcement of the rules and regulation violating safety laws. To examine legislation in the field of safety laws and to take measures to have the regulations upgraded keeping in view the needs changing with time. The Association of Victims of the Uphaar Tragedy (AVUT) has been fighting to get justice for their loved ones who were killed on June 13th, 1997 at Uphaar Cinema, New Delhi in one of the worst manmade tragedies. AVUT invested its faith in the Criminal Justice System and took up an arduous and agonizing fight for justice in the hope that it would get justice for those who were killed in the tragedy. But the final verdict of the Supreme Court we believe is certain to go down in the history as a travesty of justice. AVUT’s endeavour for past 21 years has been not only to get justice for our loved ones, but also to ensure implementation of safety laws in public spaces so that no precious human lives are lost. In the Uphaar Fire Tragedy Case Sushil Ansal who had merely under gone 5 months in jail, was allowed to walk free by the Apex Court because of his old age – a pitiful 2 ½ days in jail for each of the lives lost. Years later, we have again been reminded of the insensitivity of our times. Someone accused of killing a Blackbuck is sentenced to five years in prison.”Yeh Kaisa Insaaf Hai”? It is with utmost pain that we have come to realize that for our policy makers and decision makers, human life is of little value. The owners /occupiers are doing little to be fire compliant and the Government agencies are compromised. Wednesday, 13th June, 2018 AT 9 a.m. Please join us for the annual Havan and Shanti Paath that the families of those who lost their precious lives in the Uphaar Fire have been performing for 21 years for the peace of the departed souls. Today we pray not for justice for the departed souls, but for those who are naïve enough to seek justice in this country as we did. We urge people to take the necessary precautions to protect themselves when they’re in public buildings like malls, theatres, Hospitals, and restaurants. 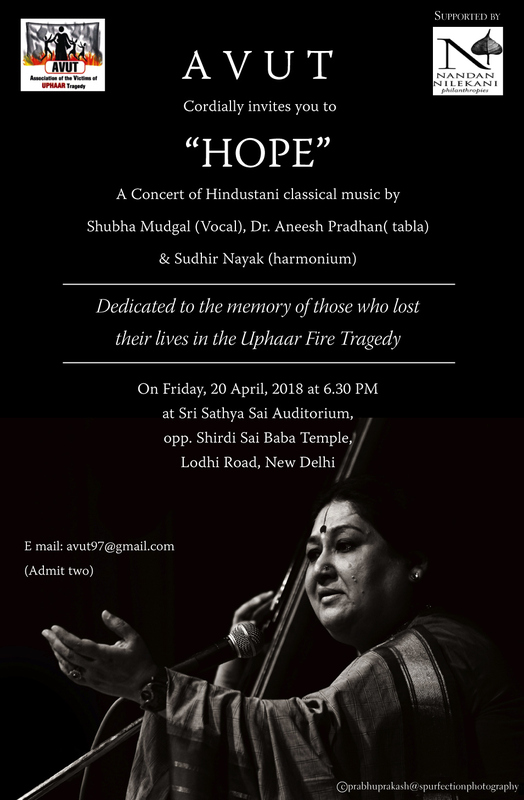 Invite for AVUT Music Concert 20, April 2018, Sri Sathya Sai Auditorium , Lodhi Road, New Delhi. All are welcome to listen to a legendary voice. Victims of the Uphaar Fire Tragedy who have waited tirelessly for two decades were deeply disappointed and distressed by the judgement they finally received from the highest court in India on 9th February 2017. We believe that the verdict is certain to go down in the history as a travesty of justice. The judgement is both unfortunate and terrible and one which shows the pro-establishment mindset of the Supreme Court. Such a judgement will only embolden the owners of public spaces to violate safety rules and compromise on safety, with no thought of endangering human lives. It is a well-known fact that law breakers are always ahead of law makers, but it is for the courts to see that justice is done and law breakers are brought to book. Our courts have not learnt from their counterparts in other countries who have dealt sternly and swiftly to deal with tragedies involving human lives. It is as if the law is being administered by our courts to nurture corporate interests and not to deliver justice. Punishment should always be proportionate to /commensurate with the gravity of offence, and factors such as economic or social status of the accused, their age, or long pendency of criminal trial cannot be construed as factors for reducing the sentence. There is a plethora of Supreme court judgements wherein the Supreme Court has incarcerated convicts for life despite their old age. In a recent judgement ( Abdul Waheed v/s State of U.P.- SCC (2016) Vol –I 583) the Supreme court in a 40 year old case, while sentencing a ninety year old man to life imprisonment has held that it is the duty of court to award proper sentence having regard to the manner in which the offence was committed. Age of the appellant and the time elapsed since occurrence is of no relevance. Undue sympathy would do more harm to criminal justice system in addition to undermining the public confidence in the efficacy of the system. Sushil Ansal, 76 year old is fit to play Golf, carry on his business activities and also make plans to relocate overseas, but strangely Supreme Court finds him too old to serve jail time. The jail sentence of one year awarded by the court to Gopal Ansal barely works out to 6 days in jail for each of the 59 he killed, whereas for Sushil Ansal who has undergone 5 months and twenty days in jail, it works out to only around 3 days per innocent victim. We have also received information recently that a mercy petition has been filed on behalf of Gopal Ansal by Senior Advocate Ram Jethmalani. The same has been received by the Ministry of Home Affairs and forwarded to the Lt. Governor of Delhi for his opinion. We are shocked that the Ministry of Home Affairs has bothered to entertain such a blatantly undeserving petition on behalf of a convicted mass murderer. We trust that our hopes will not be dashed further by the Lt. Governor by entertaining this petition. We have spent the last twenty years suffering pain, emptiness & desperation, hoping that this verdict would bring peace to the departed souls of our loved ones. We heard it said innumerable times that justice should not only be done, but must also be seen to be done. But unfortunately justice has been denied to the Uphaar victims.